OK, a few minor changes and hopefully a Christmassy-er result?? You know when you've looked at something for so long that you can't even see it anymore? Well that's me at the moment. Ignore the blur in the photo. I didn't even notice it until I'd already cropped, adjusted, etc. I think I need to get my eyes checked. I just couldn't bring myself to do full-on RED, so this is Cranberry Crisp with Red direct-to-papered on top. I've used watercolour paper for the poinsettia to get more depth of colour. So come on, (and I can't believe I'm saying this! *sigh*) be honest...is this Christmassy? Holy Cow Marelle - THAT IS STUNNING!! Absoloutely that is Christmassy - although the other one was to me too! So this is Christmas and what a great job you've done. Another card made and more to come. This is gorgeous too Marelle and without a doubt Christmassy. HO HO HO Holy cow that card has Christmas written all over it!! Beautiful! As always an absolutely stunning card. Totally christmassy. Love it. You are an amazingly talented lady. Holy holidays, Batman... that card is STUNNING! Your other card was beautiful, but this one definitely has that special-time-of-the-year-wow factor. Simply amazing! I usually lurk here, but felt it was time to speak up and say that I really enjoy your blog and think your talent is superb. Thanks, and have a great day! You've definately hit the spot on this one. The other was ...fine... but this one is stunning! Marelle,I love this set and love this card. What an idea to make it Christmassy!! Beautiful!! 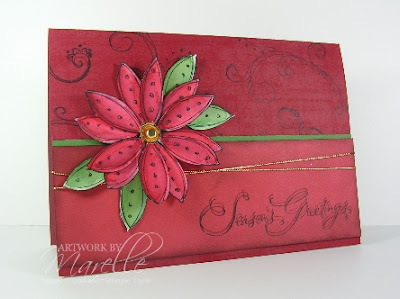 wow Marelle, you wouldn't mistake this card as anything but a christmas one, it is stunning! Well, hubby can't deny this one! Gorgeous! And VERY Christmassy! Amazing difference.